Join us in Ypsi Aug 20,21, 22 for Fun! BlogUncategorizedJoin us in Ypsi Aug 20,21, 22 for Fun! Catching river bugs at the Green Tent 2009. HRWC along with a whole group of GREEN organizations and companies is heading to Ypsilanti this weekend. We’ll be under the GREEN TENT in Riverside Park at the Ypsilanti Heritage Festival, Aug 20-22. The GREEN TENT highlights organizations working in Southeastern Michigan that protect the environment, conserve energy, and provide people access to healthy locally grown foods. Festival attendees can participate in a variety of fun activities including catching river bugs in the Huron, seeing birds of prey up close, or buying locally grown seasonal fruit. Come on down show your support and enjoy all that the Festival has to offer. 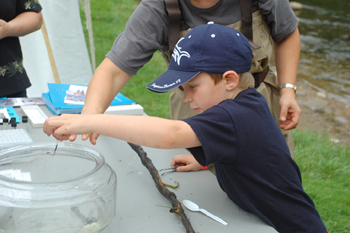 Saturday, 11am-5pm — Catch river bugs in the Huron with Adopt-A-Stream. Sunday, Noon-5pm — Make your own print of a freshwater fish, children’s art activity. All weekend — Enter our “Canoe Raffle” for a chance to win an “Old Town Rockport Canoe” valued at $539.